If you are about to build your dream home, or are planning a major renovation, there are many design concepts, and glass would likely play a major role in whatever you finally decide on. Modern solutions allow for made to measure shower screens and stylish splashbacks, all hand crafted to perfection. Before you start to look at concepts, here are some ideas to bear in mind. Once you know your total dimensions, you can begin to plan the shower location and size. The bath has seen its day, and with more effective use of the water, a modern shower unit is an eco-friendly way to go. This would be the time to contact a specialist company that only works with glass, and if you are based in the Perth area, we at PCG would always be happy to give you the benefit of our experience, and you can contact us anytime and we will do what we can give you some inspiration. 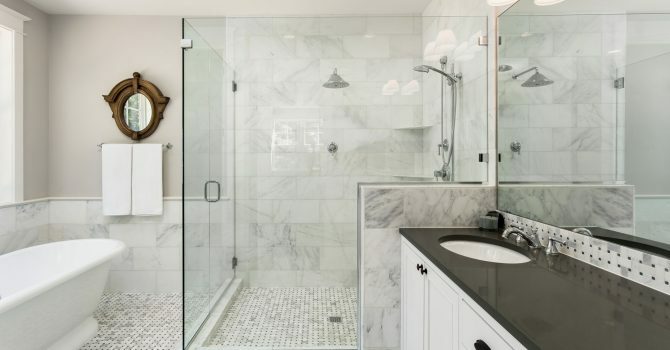 The ultimate in style and elegance, a frameless glass shower screen will become a focal point of the room, and with functionality and hygiene, your new bathroom will be a place every family member will want to hog. Innovative designs allow for creativity, and with everything cut to exact size by our professionals, the new shower corner will fit perfectly. Small bathrooms tend to benefit from a corner shower unit, with a single sliding door that can slide either way, depending on the location. If you call us in at the design stage, you might discover you have more options that you originally anticipated, and once the design has been agreed, we will be ready when you are to install and finish. Depending on size, there is a choice of opening styles, with sliding or opening outwards both available, and if you have the space, why not go for a triple sliding unit, with a double shower head? Matching glass splashbacks will enhance the look, and with glass so easy to clean, your bathroom will always be in pristine condition. At PCG, our team of bathroom designers would be only too happy to suggest some variations on how to make the most of the available space by creating the perfect shower screens. No bathroom would be complete without a tasteful set of mirrors, and we can design and cut the perfect units, whether you prefer floor to ceiling, or perhaps a mid-size wall mounted mirror. If you are seeking the seamless look, frameless mirrors will certainly enhance that, and with a range of tints, you can easily create the perfect ambience. Only toughened safety glass is used, and with special fittings, your sleek mirrors will be a focal point in the bathroom. At Perth City Glass, we thrive on the challenge of creating something unique, and with bathrooms, we can really get creative and give the customer that sleek, elegant look.